One of our most popular subjects continues to be converting VHS tapes to DVD or other digital formats, and one particularly popular product is the all-in-one Panasonic DMR-EZ47V DVD & VHS recorder. Sadly, that Panasonic product, though still wildly popular is showing its age, and now that it’s hard to come by, indie vendors are price gouging. What once cost under $300 is now over $450! So we decided to take another look at this product niche to see what other options exist. Only a few big-name vendors like Toshiba and Magnavox still seem to be in the game of making these combo DVD/VCR recorders. Here are 2 products that we found that felt were worth your time considering: 1 each from Toshiba and Magnavox. This Toshiba (approx $157) all-in-one bills itself as a one-touch recorder. So pop in your VHS tape and your blank DVD, hit a button and wait. 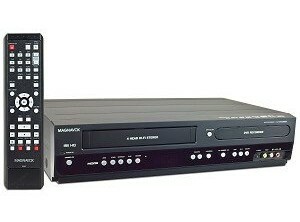 But it actually can go the other way (2-way dubbing) and record from your DVD over to VHS. Why you would want to do that beats me, but there you go 😉 It even lets you edit the title lists that DVDs are able to store, so you can break up that monolithic VHS tape into meaningful sections. But although VHS tape conversion may be your main goal, this unit can do much more including playing those DVDs back on your TV, via HDMI if you’d like as well. It can be used to record TV, but you’ll need an external tuner (like your cable box). Here’s a link to the manual if you’d like to get every single last detail on this model. This Magnavox (approx $210) is also very popular and offers many of the same features as the Toshiba above, but at a slightly higher price (approx $210). It has 2-way dubbing (VHS to DVD and vice-versa), is able to playback audio CDs with MP3s, CDs with Kodak Picture, offers theater surround sound when using a Dolby Digital decoder. It offers extensive editing of DVD titles, chapter marks and even setting thumbnail pictures. And like with the Toshiba, you can record from an external source (like your cable box). These both appear to be 2 solid models if your main aim is to permanently retire your VHS tapes. If I had to pick, I’d go for the Toshiba, as it seems to have as many if not more features and at a lower price. Unfortunately, this product category is in decline since the death of VHS tape, and there aren’t any new products being made, which explains why the pure converter manufacturers have been able to take a foothold. Companies like Elegato, Honestech, Hauppage, and AverMedia make small hardware converters that typically perform analog to digital conversions and usually come with software for further tweaking the inputs and outputs. For example, we’ve reviewed the excellent Honestech VHS to DVD. Yes, these are much more DIY-styled products that require a bit more assembly and some basic computer skills, but they do tend to be cheaper than one of these all-in-one VHS-DVD recorders and they also tend to accept and convert to many more formats including audio. They are definitely worth considering as well. WHAT ABOUT VHS TO DVD AND INTERNAL HARD DRIVE (HDD DVER). THERE’S ONLY ON 1TB MAGNAVOX AT WALMART AND IT’S $250, BUT MOST OF THE SOFTWARE AND ITEMS YOU MENTION ARE AS YOU SAID, POORLY BACKED, DISCONTINUED OR HAVE NO CSR SUPPORT BRAINWAVE. I’M NOT SURE A DYING PRODUCT LIKE THE MAG/FUNAI UNITS ARE A SMART BUY, BUT I’VE GOT VHS TAPES ALL OVER, AND THEN DVDS (WHICH ARE BOUND TO BE ANTIQUATED SOON ENOUGH). I KNOW THIS SOUNDS LIKE OVERKILL, BUT I RESENT THE FACT THAT I CAN’T JUST DUMP ALL THIS STUFF ONTO A BIG EXTERNAL HARD DRIVE AND THEN PLUG IT IN TO ANY HDTV, NOT HAVE TO BUILD UP A MACHINE NO ONE WILL WATCH IN 5 YEARS, OR DEAL WITH IDIOSYNCRACIES IN MAC/SOFTWARE FOR ALL THIS! @John – sounds like you need a media server, that you can buy/build with lots of storage. And if you build it yourself with a computer base, you can expand it by tacking on hard drives as you need. You’re still going to need some sort of adapter/converter to get your content from VHS tapes and/or DVDs over to your media center. I put my VHS and SVHS tapes into my VCR and take the audio and video RCA output of the VCR to the analog input on an old tape digital camcorder and then use the firewire out of my camcorder to my PC. Capture software does the rest and then onto the editing process. The Best Buy guy told me that these machines don’t work with commercial VHS tapes. Is there any way to transfer these tapes that I own and that aren’t being re-issued as DVDs? I hate to think that there is no way to preserve this content. Really? Did he say what the technical reason was? the instructions are not that clear . Hi Jack – if you have an all-in-one VHS + DVD recorder like the Magnavox, then you don’t necessarily need the Dazzle, unless you want to really tweak your videos a lot. The all-in-one is the most straightforward way to get those tapes over to DVD. Of course, one other option is to treat your Magnavox as purely a VHS player and hook up its output to the Dazzle (they both support S-Video for example and RCA plugs), then you need to follow the Dazzle & Studio instructions for video capture.